URGENT - Gravely Ill Iranian Blogger Hossein Ronaghi Maleki Is Back In Prison Where He Could DIE! URGENT UPDATE: HOSSEIN RONAGHI MALEKI ON DANGEROUS PRISON HUNGER STRIKE SINCE MARCH 26--April 15 201i6- Prisoner of conscience Hossein Ronaghi Maleki, who has been on dry and wet hunger strikes since March 26, 2016 to protest being denied crucial medical treatment, is in critical condition, but has vowed to continue until his situation changes. His mother, who visited Maleki in Evin Prison on April 10, said that the food and liquid deprivation has made her son, who is suffering from kidney disease, dangerously weak. Mousavi said that she and her husband, Ahmad Ronaghi Maleki, had gone to the prosecutor’s office in Tehran every day for a week but the officials refused to provide a clear solution for resolving the situation. Political prisoners in Iran are singled out for particularly harsh treatment, which often includes denial of medical care, in direct violation of Iran’s own laws and prison regulations. While in prison, Maleki has suffered digestive track, breathing and kidney problems. He has also undergone several surgeries. He was granted medical furlough on June 14, 2015 upon posting bail in the amount of 4 billion rials (about $132,000 USD), but was returned to prison before his treatment was completed on January 20, 2016. “Isn’t seven years in prison enough for a young man?” she said. Maleki’s father began his own hunger strike in front of Evin Prison on April 9, 2016 to bring attention to his son’s plight. But Mousavi urged her elderly husband to end his strike soon after. Following the recent prisoner swap between Iran and the United States, which resulted in the release of four detained Iranian-Americans, Maleki’s father asked why Iranian political prisoners who don’t hold dual citizenship remained unjustly incarcerated. “As a father I want my son to be free, too,” Ahmad Ronaghi Maleki told the Campaign in January 2016. “All these years I have been running around shouting for my son’s freedom so that someone might hear me,” he said. HRANA News Agency – Hossein Ronaghi’s family is again appealing to the Tehran prosecutor's office based on their son's inability to withstand prison conditions and denial of medical care. In addition to having only one functioning kidney, his ailments also include: Angina, swelling of the face, stomach bleeding, blood and eye infections, lung problems and respiratory problems. On that basis, and with the findings of Iran's own Medical Examiner, the Ronaghi family has requested the issuance of the certificate of inability of tolerating punishment. According to the report of Human Rights Activists News Agency (HRANA), Ahmad Ronaghi, his father, visited the Tehran Prosecution Office on Saturday, March 5th, to follow up the furlough for Hussein or transferring him to the hospital, and went to meet him on Sunday. Hossein Ronaghi, a human rights activist and blogger, was arrested in 2009. Branch 26 of the Revolutionary Court sentenced him to 15 years in prison after 10 months of detention in Ward 2-A of Evin prison, on October 13, 2010. The charges against him in the court were “membership in the Iran Proxy network, insulting the leader and insulting the president”. The sentence was upheld by Branch 54 of the Appeals Court and Hossein then he was transferred to Ward 350 of Evin prison. The prisoner is now in Ward 7 in Evin Prison, being held in poor conditions and is being denied needed medical care in direct violation of Article 102 and 103 of Iran's own Prison Regulations. URGENT UPDATE MARCH 7, 2016--HEALTH OF HOSSEIN RONAGHI CONTINUES TO DETERIORATE IN PRISON AS HE DEVELOPS LIVER DISEASE IN ADDITION TO LIFE-THREATENING KIDNEY AILMENT: The health of jailed blogger and activist Hossein Ronaghi-Maleki continues to deteriorate in prison. The young Iranian, who suffers from serious kidney problems, has now been diagnosed with liver disease too, according to his family. Ronaghi-Maleki is currently serving a 15-year prison sentence for his work as a human rights activist and blogger. He has only one functioning kidney and needs constant monitoring and access to specialized medical care, which he cannot get in prison, according to his doctors. Since the blogger returned to Evin Prison on January 20, 2016 following medical leave, his condition has worsened further due to extreme medical negligence. Yet prison authorities have repeatedly refused to hospitalize him. According to one of his relatives, Ronaghi-Maleki was transferred to hospital for medical tests and ultrasound on Saturday, March 5, but only for a short two-hour visit, before being sent back to Tehran’s notorious Evin Prison. He was reportedly diagnosed with liver disease and is “critically ill,” the relative said. The relative spoke to Journalism Is Not A Crime on the condition of anonymity, as talking to the media about human rights issues can have serious consequences in Iran. Ronaghi-Maleki’s father was in July 2015 sentenced to four months in prison for giving interviews to the media about his son’s situation. Hossein Ronaghi-Maleki was arrested in the aftermath of the disputed 2009 presidential election and sentenced to 15 years in prison on charges including “spreading propaganda against the regime” and “insulting the supreme leader”, allegedly in connection with articles he had posted on his blog. In June 2015, he was granted medical leave from prison after posting bail, but despite his serious condition, the prosecutor’s office ordered him back to Evin Prison last month. In an interview with IranWire last year, Hossein’s father, Ahmad Ronaghi-Maleki, expressed major concern for the treatment of his son in prison: “They want to turn him into another Sattar Beheshti,” he said, referring to a blogger and activist who died in 2012 while in custody. URGENT UPDATE SATURDAY, 20 FEBRUARY 2016 -- A RELATIVE REPORTS THAT HOSSEIN, BACK IN PRISON FOR ONE MONTH, IS BEING DELIBERATELY DENIED LIFE-SAVING MEDICAL CARE: IranWire, February 19: Prison authorities are denying medical care to jailed Iranian blogger Hossein Ronaghi-Maleki, according to one of his relatives. Authorities deny Ronaghi-Maleki, who suffers from serious kidney problems and other health issues, is ill and have refused to allow him to go to hospital since he returned to Evin Prison on January 20, 2016. The relative of Ronaghi-Maleki spoke to Journalism Is Not A Crime on the condition of anonymity, as speaking out on human rights issues can have serious consequences in Iran. In July 2105, Ronaghi-Maleki’s father was sentenced to four months in prison for giving interviews to media about his son’s situation. Hossein Ronaghi-Maleki was arrested in the aftermath of the disputed presidential election of 2009 and sentenced to 15 years’ imprisonment for his work as a human rights activist and blogger. Prior to his arrest, he had been suffering from kidney problems, but his conditions worsened further while in prison due to physical abuse and severe medical negligence. In June 2015, Ronaghi-Maleki was granted medical leave from prison after posting bail. However, despite his deteriorating medical condition he was ordered back to Evin Prison last month – against doctors’ recommendations. "Might be last post but I'm determined to gain my freedom bec I'm innocent. The response to opinions is not prison." URGENT UPDATE MONDAY, JANUARY 11 2016--HOSSEIN RONAGHI MALEKI TOLD HE HAS TO RETURN TO PRISON IN 7 DAYS: On his Twitter account, Hossein Ronaghi reported on Monday that the Judiciary is ordering him back to prison by Monday, January 18--where, once again, his life will be in grave danger. On Monday, January 11 Hossein tweeted: "In 7 days I must return to prison, but not with my own feet..." Later, he also tweeted: "I will not bow down to the baseless & groundless charges of the judiciary nor will I accept the unjust verdict." UPDATE JUNE 28, 2015--Hossein was finally released on furlough on June 17, 2015 at the urgent insistence of his examining doctor. However, at the end of June he received a phone call telling him that he must return to prison. He turns 30 years old on July 4, and is at risk of being hauled back to prison at any moment. His life will be put in IMMINENT DANGER if he is returned yet again to the horrible conditions and medical neglect of Evin Prison! The father of blogger Hossein Ronaghi Maleki, who, prior to a six-month medical furlough granted for severe illness had been imprisoned since 2009 for his peaceful activities following the disputed 2009 presidential election in Iran, is appealing for an end to his son’s incarceration after the blogger was returned to prison. “My son has been found unfit to serve his sentence by the state Medical Examiner because he has multiple medical problems. Therefore he should not return to prison. But I don’t know why the authorities have again summoned him to prison,” Ahmad Ronaghi Maleki told the International Campaign for Human Rights in Iran. Dozens of prisoners remain held in Iranian prisons since the state crackdown that followed the peaceful protests over that election, six years after the events. Imprisoned at Evin, Maleki suffered numerous kidney and stomach illnesses for which he was transferred to the hospital several times. He was given a six-month medical furlough on September 4, 2014, and then summoned earlier this month to return to prison. The denial of medical care is a routine practice in the Iranian prison system, especially in the case of political prisoners and prisoners of conscience. Maleki’s father told the Campaign his son was falsely accused of trying to escape the country while he was on furlough. The following is the full text of the letter of Seyyed Ahmad Ronaghi Maleki, a copy of which has been submitted to HRANA. With all respects, first of all I would like to express my sincere gratitude to you and those who serve our country and nation. Dear honorable Attorney General, I thank you, your assistant Mr. Yousefi, and your colleagues at the office of the attorney general as well as the agents of the intelligence service. Dear Attorney General, I received a phone call from the office of Mr. Khodbakhsis, the deputy of the attorney general on the prisoners affairs, on Tuesday, requesting Hossein to attend the medical commission. We agreed to meet him at his office the following Saturday. We arrived at 9:00 AM but Mr. Khodabakhshi had already left his office to attend a meeting in the same . Because he was not in his office, I handed in a copy of a letter that was written in December 4th 2014 to his secretary (a copy of this letter with No. 301/13479/9001- has been submitted to Mr. Yousefi). His office staff asked me to write another letter and take it to the office of Execution of Verdicts – Shahid Ghodousi Unit and bring the response by 12:00 PM. I took the letter to Evin, and the soldiers handed the letter to the executive committee after one hour. About half an hour later, I was contacted and told that the authorities want Hossein. I told them that Hossein was at the hospital. They asked me to call Hussein and he did. Hussein entered the courthouse but later we were told (at 3 PM) that he was arrested because he was a fugitive. I ask Mr. Khodabakhshi, “How could my son be a fugitive? He had a letter from the medical commission of Shahrak-Gharb, requesting to be exempted from spending time in jail because of health issues. Moreover, the judge and the attorney general both authorized his release because of these issues. If he was a fugitive, how could I turn him to you on Tuesday (only three days after the request we received on Saturday). Ever since his arrest on Tuesday at 3:00 PM, he has been put in the quarantine in the worst possible conditions. We have been threatened to be severely punished if we inform the media and public. Dear Mr. Dolatabadi, the life of my child is in danger. I have informed Mr. Khodabakhsi about Hossein’s situation. Later, I was told that Hossein will be transferred to the section 350 of Evin prison, however this was a clear lie. Hussein called us around 5:30 and mentioned that he has been kept in he quarantine where there is no medical attention or medicine. He has been standing all the time. Dear Mr. Dolatabadi, the life of my child is in danger. They want to kill my child. My son deserves to be considered for the Supreme Leader’s Pardon, but our requests to review this opportunity and release Hussein have not been responded. I have contacted your office multiple times, but the operator didn’t connect me to your office staff. Is this the way to help and serve the people of Iran? I have contacted the Execution of Verdicts Unit, but every single time my calls have been intentionally disconnected. The authorities do not care about the pains and problems that Iranian citizens have to endure. It is really unfortunate that the chief of the Execution of Verdicts Unit of Shahid Ghodousi behave indifferently with respect to a sick person who has lost one of his kidneys and needs serious medical attention. Moreover, the judiciary system is responsible to look for the security of the Iranians. But, why my family, my child and myself don’t feel secure? My son had told Mr. Khodabakhshi several times that he was feeling very sick and could die. Mr. Khodabakhshi, in response, had told him that many people had been dead and foreign media such as BBC had highlighted the news for a couple of days and the everything was forgotten. I responded to Mr. Khodabakhshi that this kind of behavior was not acceptable. I, Seyyed Ahmad Ronaghi Maleki, ask the supreme leader, the attorney general Mr. Dlatabadi, the minster of intelligence, and government officials the security and safety of my son, Seyyed Hussein Ronaghi Maleki and my family. Hello, I would like to inform you that I, Seyyed Ahmad Ronaghi Maleki father of Seyyed Hussein Ronaghi Maleki have submitted all medical records and documents of my son to the honorable prosecutor, the clinic of Evin prison, and the medical commission of Shahrak-Gharb. Moreover, my son has been previously introduced to the medical commission of Shahrak-Gharb. I have requested multiple times to pardon my son through the Supreme Leader’s Pardon program. I have submitted these requests to the office of the head of judiciary system and the attorney general of Tehran. Dear Mr. Khodabakhshi, my son has had no interview with any type of media during his sick leave and is not a political activist. I ask the honorable prosecutor and the attorney general to help me rescue my son. His life is in danger and he needs to be pardoned based on the Supreme Leader Pardon program. My son has lost one kidney and is suffering from severe digestive system complications. If my son is taken back to the prison his health situation will be further deteriorated and could die. The medical commission has already submitted the results of his medical records analysis. I ask all the authorities of this country to support us; we thank you all for your service. It should be noted that My son and I are planning meet you in your office on Saturday as coordinated before. URGENT UPDATE MARCH 12, 2015--GRAVELY ILL IRANIAN BLOGGER HOSSEIN RONAGHI MALEKI, STILL ON LIFE-THREATENING HUNGER STRIKE, IS NOW HELD IN EVIN PRISON'S WARD 7 AND IS BEING DENIED HIS MEDICATIONS! 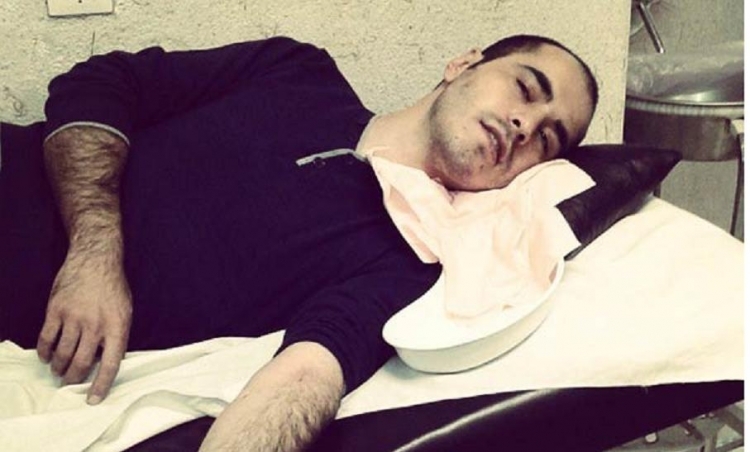 March 4, 2015--GRAVELY ILL IRANIAN BLOGGER HOSSEIN RONAGHI MALEKI HAS BEEN RE-ARRESTED, AND IS ONCE AGAIN ON A LIFE-THREATENING HUNGER STRIKE! When Ahmad Ronaghi-Maleki speaks about his son, his voice shakes with emotion. He utters his name softly. But when it comes to the subject of Hossein Ronaghi-Maleki's imprisonment and the illegal treatment he has endured while incarcerated, Ahmad Ronaghi-Maleki’s tone changes. He is angry and determined. “They want to kill my son,” he shouts. “They want to turn him into another Sattar Beheshti.” Beheshti, a blogger and activist, who died in 2012 while in custody. Blogger and activist Hossein Ronaghi-Maleki was arrested on February 28. He had previosusly been released from prison on September 3, 2014 after the Supreme Leader pardoned him on medical grounds. It was thought that he was in such poor health that that he would not live to serve out his sentence. But soon after his release, he was re-arrested. In recent weeks, his father has contacted the prosecutor’s office and the prison warden, hoping to get further information about his son. He has called the judge in charge of the case, but has had no reply. After his latest arrest, Hossein Ronaghi-Maleki was sent to Ward 8 of Evin Prison. His father says the ward is unbearably cold, and that his son has gone on hunger strike to protest against prison conditions and his arrest. He says he is determined to continue his hunger strike until he is released. As of the last week of February, he was still on strike. “What difference does it make if I die by myself or I am killed?” Hossein Ronaghi-Maleki told his father over the phone. Prior to his initial arrest in 2009, Hossein Ronaghi-Maleki blogged under the penname Babak Khorramdin, in honor of the 9th century Iranian freedom fighter who fought against Arab occupation. He studied software engineering at university and worked with the anti-censorship cyber group Iran Proxy, which enabled Iranians to circumvent government filters. According to the Iran-based Committee for Human Rights Reporters, Maleki’s expertise was in computer programming; he was adept at setting up websites that navigated around government censorship and established ways to access blocked addresses. He was especially active in the aftermath of the disputed 2009 presidential election. The Cyber Police unit of the Revolutionary Guards arrested Hossein Ronaghi-Maleki and his brother Hassan on December 11, 2009 at their father’s home. Both were taken to Section 2A of Evin Prison, which is controlled by the Revolutionary Guards, and put under intense physical and mental pressure to sign confessions. It was believed that authorities arrested Hassan Ronaghi-Maleki, who was not politically active, in order to force Hossein to confess. Hassan was released on bail after spending a month in solitary confinement, but Hossein remained in a solitary cell for a total of 13 months. Maleki’s case was sent to Branch 26 of the Revolutionary Court presided over by Judge Pir Abbasi, who sentenced him to 15 years in prison for his cyber activities and for insulting the Supreme Leader, a verdict which was upheld by the appeals court. “He suffers from kidney problems, intestinal hemorrhaging and an uncontrollable urination problem,” his father tells IranWire. Prior to his arrest, Hossein had begun suffering from kidney problems, but his condition worsened after he was subjected to physical abuse and prison authorities failed to offer him medical care. The former blogger and prisoner is not yet 30; he has spent five years in prison. This is not the first time he has gone on hunger strike — there were fears for his life in 2012. Today, his health is fast deteriorating. “How can they behave this way?” his father asks. “Why, under the Islamic Republic? I plead with the Supreme Leader, with the head of the judiciary, with the prosecutor and MPs to look into my son’s situation.” Once again, he draws a parallel with the case of Sattar Beheshti. He bursts into tears and cannot continue. AND WHEREAS: He came VERY close to death during earlier stays in prison due to medical neglect and the toll his hunger strikes took, and was told point-blank by a Judiciary official: "You will DIE in prison and the world will forget you!" THEREFORE: We, the undersigned, demand that ALL levels of the international community act FORCEFULLY to insist that the Islamic Republic of Iran respect its own laws and binding obligations under international treaties and covenants by IMMEDIATELY and UNCONDITIONALLY releasing Hossein Ronaghi Maleki from prison, pardoning him once and for all, and securing for him ALL needed medical care. The URGENT - Gravely Ill Iranian Blogger Hossein Ronaghi Maleki Is Back In Prison Where He Could DIE! petition to UN, Ban ki-Moon, OHCHR, Navi Pillay, Ahmed Shaheed, State Department, EU, European Parliament was written by John S. Burke and is in the category Human Rights at GoPetition.